Most of Hatteras Island is protected land comprising one of the USA's most visited National Parks. The Cape Hatteras National Seashore has a rich history that includes a 16th century Italian explorer (Amerigo Vespucci), tales of the notorious pirate Blackbeard, and wreckage of ships destroyed by German U-boats. It also is the site of a maritime forest, Buxton Woods Coastal Reserve, and the Cape Hatteras Lighthouse, the tallest lighthouse in the country, where the Gulf Stream meets the Labrador Current. The Cape Hatteras Lighthouse has a visitors center showcasing the island's maritime history. Its beacon can be seen 20-miles out to sea. 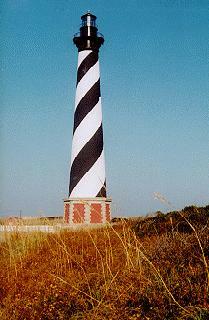 Because of its diagonal stripe design, the lighthouse was given the nickname "The Big Barber Pole." The Cape Hatteras National Seashore runs from south Nags Head to Ocracoke Inlet and includes Hatteras Island and Ocracoke Island. It is 75 miles long and 30,000 acres total. Visitors enjoy many outdoor activities and historic attractions in this area. There are four campgrounds available to visitors.